I know you can't tell me exactly, but if I'm only printing full colour A4 flyers (full page graphics) with Xerox Phaser 7800 cartridges, can you give me a rough idea of how many pages I would expect? I'm happy with a very rough idea! Thank you. Unfortunately, we could not say as it depends on the nature of your printing. The figures on the site are based on 5% coverage of an A4 page which is roughly the equivalent of 5 lines of text. The Phaser 7800 office colour printer by Xerox is aimed at creative environments that require high quality output, so it boasts a 1200x2400dpi print engine, reasonably fast print speeds, and a network-friendly interface. However, the firmware and driver that comes with the Xerox Phaser 7800 laser printer need improvement. 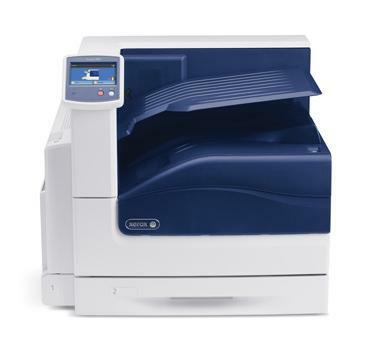 The Xerox Phaser 7800 tabloid colour laser printer for professional graphic arts is slightly tall and looks similar to most boxy laser printers. Up to three paper trays can be integrated into the Xerox Phaser 7800 colour printer. The minimalist control panel features a colour display screen and minimal operational buttons on the left-hand side. It is a fully-featured machine with two-sided printing, a 160GB hard disk drive, Pantone emulation, and a generous 2GB RAM for more speed. Colour output is produced accurately by the Xerox Phaser 7800 printer because of the signature software that comes with the machine, while text documents are printed with crisp and sharp details, and in true black. The Phaser 7800 is also easier to operate because of the colour display screen. It also comes with security features like disk overwrite and IP filtering. Users can save money in the long run if they buy high capacity Xerox 7800 laser toners which are more cost-effective when handling heavy workloads. One of the issues with the Xerox 7800 is the way it handles paper. Users need to configure the paper type and size manually before loading their media of choice. Otherwise, the job would fail. Next is the firmware and driver of the Phaser 7800 A3 colour printer, which are still prone to bugs and errors.